48 Hereford is located on the east side of Hereford, between Commonwealth and Newbury, with 46 Hereford to the north and 50 Hereford to the south. 48 Hereford was designed by Ernest N. Boyden, architect, and built in 1885-1886 by Albion Knowlton, builder, for Edwin B. Horn, Jr., a jeweler and real estate developer. It was one of four contiguous buildings (46-48-50-52 Hereford) built for Edwin Horn, designed as a symmetrical group, with 48-50 Hereford a symmetrical pair of single-family dwellings, flanked by 46 Hereford and 52 Hereford, each a four-family apartment building. Edwin Horn is shown as the owner on the original building permit applications for 46, 50, and 52 Hereford, all dated May 7, 1885 (the application for 48 Hereford has not been located). Click here for an index to the deeds for 48 Hereford. On November 19, 1885, 48 Hereford was purchased from Edwin Horn by Hiram Walter Roby, a produce and provisions merchant. That same month, he also acquired the apartment house at 46 Hereford. H. Walter Roby and his wife, Philena E. (Batson) Towle Roby, lived in one of the apartments at 46 Hereford. The previously had lived at 7 Pembroke. On October 4, 1886, 48 Hereford was acquired from H. Walter Roby by Sarah A. (Stevens) Hill, the widow of Luther Hill, a shoe manufacturer. She previously had lived in Stoneham, and resumed living there by 1889. During the 1888-1889 winter season, 48 Hereford was the home of Sarah E. (French) Allen, the widow of iron and steel merchant Stephen G. Allen. She lived there until her death in March of 1889. On June 27, 1889, 48 Hereford was acquired from Sarah Hill by Margaret A. (Fitzpatrick) Towne, the wife of George E. Towne. They previously had lived in Brookline. He was treasurer of the Continental Mills of Lewiston, Maine, makers of sheeting and other textiles. 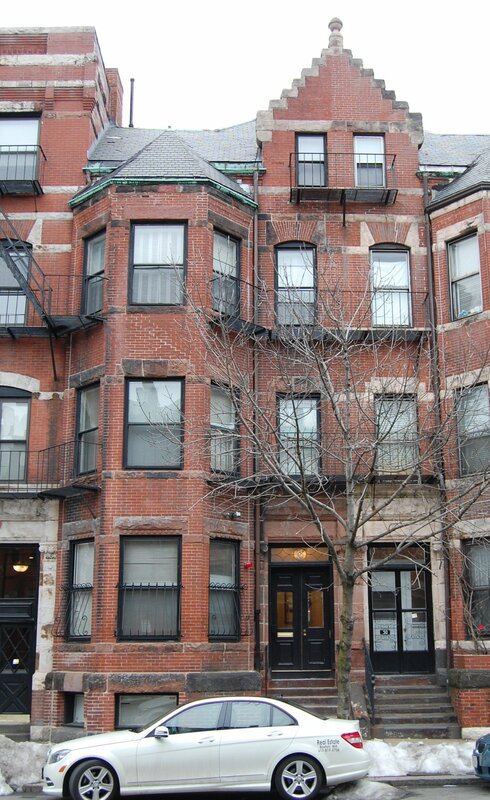 They continued to live at 48 Hereford during the 1890-1891 winter season, but moved thereafter back to Brookline. Margaret Towne continued to own 48 Hereford and lease it to others. During the 1891-1892 winter season, 48 Hereford was the home of Mr. and Mrs. G. M. Dodge, probably General Grenville Mellen Dodge and his wife, Ruth Anne (Annie) (Browne) Dodge, whose usual residence at this time was in New York City. General Dodge had served in the Civil War and was a railroad investor and developer. Fort Dodge and Dodge City, Kansas, were named for him. By the 1892-1893 winter season, 48 Hereford was the home Frank E. Clark and his wife, Jennie Estelle (Thompson) Clark. They previously had lived in Lexington. He was a confectioner. They continued to live at 48 Hereford during the 1896-1897 season, but moved back to Lexington soon thereafter. On September 28, 1897, 48 Hereford was purchased from Margaret Towne by Margaret A. (Duffee) Lennihan, the wife of Charles Joseph Lennihan. They previously had lived in West Dedham. Margaret Lennihan’s half-brother, Richard Henry Hussey, lived with them. Charles Lennihan and Richard Hussey were partners in the plumbing firm of Henry Hussey & Co., founded by Richard Hussey’s father. 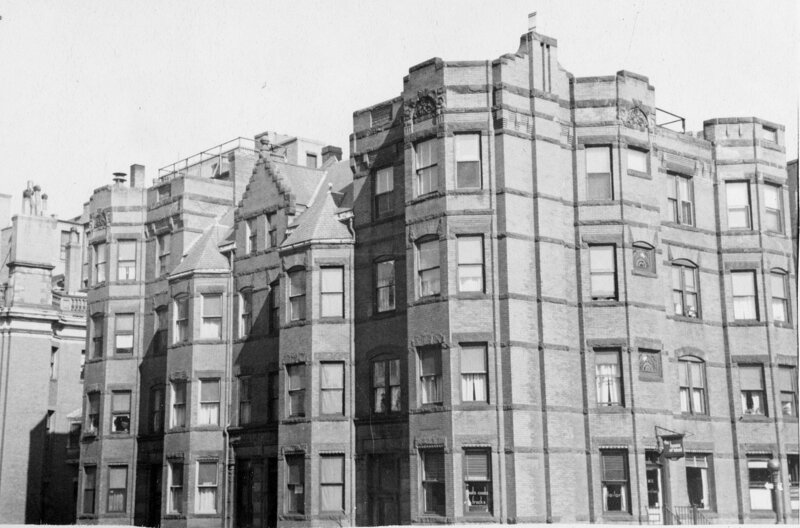 The Lennihans continued to live at 48 Hereford during the 1898-1899 winter season, but moved thereafter and by the 1901-1902 season were living at 418 Newbury. Margaret Lennihan continued to own 48 Hereford and lease it to others. 48 Hereford was not listed in the 1900 Blue Book. During the 1900-1901 winter season, it was the home of Charles Merrill Norcross and his wife, Louise G. (Webber) Markham Norcross. They previously had lived at 146 St. Botolph. He was an advertising agent. By 1902, they were living in Medford. 48 Hereford was not listed in the 1902 Blue Book. By the 1902-1903 winter season, it was the home of George Richard Leghorn and his wife, Mary (Van Horn) Leghorn. He was a dry goods merchant and later would become treasurer of the Hotel Somerset. 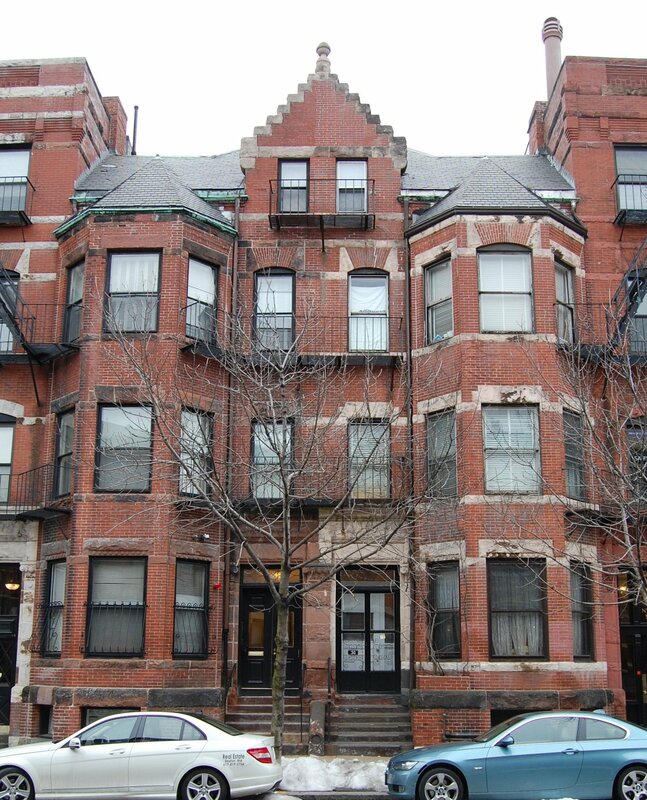 They continued to live at 48 Hereford during the 1903-1904 season, but had moved thereafter to 296 Newbury. In about 1904, the Lennihans moved back to 48 Hereford. They continued to live there in 1905, but had moved by 1906. Also in 1904, 48 Hereford became the fraternity house of the MIT chapter of Phi Sigma Kappa fraternity. It previously had been located at 197 Longwood Avenue. It continued to be located at 48 Hereford in 1906, but moved that year to 525 Newbury. In 1908, it moved again, to 282 Dartmouth. On March 17, 1905, 48 Hereford was acquired from Margaret (Duffee) Lennihan by her mother, Margaret A. (Burke) Duffee Hussey, the widow of James Duffee and of Henry Hussey. On April 8, 1905, it was acquired from her by her son, Richard H. Hussey. At about this time, Richard Hussey withdrew from his partnership with Charles Lennihan in Henry Hussey & Co. and became a dealer in men’s furnishing goods. In May of 1905, Richard Hussey married Edith Provonchee; after their marriage, they lived in Brookline. On July 30, 1907, 48 Hereford was purchased from Richard Hussey by Mary Ellen (Brady) Belanger, the wife of Victor W. Belanger. They lived in Marshfield and also had lived at 17 Marlborough, where they had operated a lodging house. Victor Belanger was an editor, founder of Le Courrier de Worcester. and an inventor, credited for developing a rotating coil for spinning cotton. Mary Belanger leased 48 Hereford to others. By the 1907-1908 winter season, 48 Hereford was the home of Dr. George Sherwin Clark Badger, a physician, and his wife, Grace M. (Spear) Badger. He also maintained his medical office there. They previously had lived (and he had maintained his office) at the Hotel Cambridge at 483 Beacon. They continued to live (and he to maintain his office) at 48 Hereford in October of 1918, but had moved to 435 Marlborough by 1919. 48 Hereford was not listed in the 1919 and 1920 Blue Books. By the 1920-1921 winter season, Mary Belanger had made 48 Hereford her home. 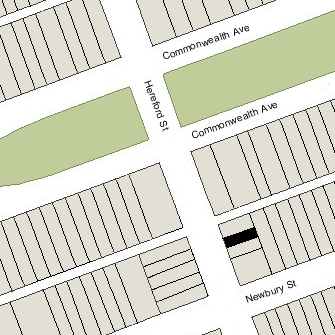 Victor Belanger had died in August of 1916 in Marshfield, and by 1920 she had moved to 34 Newbury. Their daughters, Mary Angelique Belanger and Victorine Belanger, lived with her. She continued to live at 48 Hereford during the 1921-1922 season, after which she and Angelique Belanger (and probably also Victorine Belanger) moved to an apartment at 499 Beacon. On October 11, 1922, 48 Hereford was acquired from Mary Belanger by real estate dealer John S. Cronin. By 1923, 48 Hereford was the home of Max Stanga and his wife, Mary (Ryan) Stanga, who operated it as a lodging house. They previously had lived at 285 Newbury. Max Stanga was a salesman and later was doorman at the Harvard Club at 374 Commonwealth. On January 14, 1924, Mary Stanga purchased 48 Hereford from John Cronin. Mary Stanga died in October of 1934. Max Stanga married again in 1935 to Nellie Maria (Scanlon) Stevens, the widow of Edwin S. Stevens of Acton. After their marriage, they lived in an apartment at 52 Hereford. On December 18, 1935, the State Street Trust Company foreclosed on a mortgage it held on 48 Hereford and took possession of the property. On April 15, 1936, it was acquired from State Street Trust by real estate dealer Ray C. Johnson. 48 Hereford was shown as vacant in the 1936 and 1937 City Directories. On October 29, 1937, 48 Hereford was acquired from Ray C. Johnson by Mrs. Dorrien June (Tice) Knott, the former wife of Kenneth Woodhouse Knott, who operated it as a lodging house. She previously had lived at 293 Newbury with her parents, Culver Louis Tice and Catherine (Power) Tice (in 1935, they all had lived at 51 Hereford, and by 1939 her parents were living at 53 Hereford). Dorrien Knott married again in 1944 to George Manoly. He was a paint sprayer. They continued to live at 48 Hereford until about 1947. On February 24, 1947, 48 Hereford was acquired from Dorrien (Tice) Knott Manoly by Thomas E. Good and his wife, Marguerite M. (Kelly) Good, who operated it as a lodging house. They previously were lodgers at 359 Beacon. On June 3, 1964, 48 Hereford was purchased from the Goods by Florence Beth Pockwinse, who operated it as a lodging house. 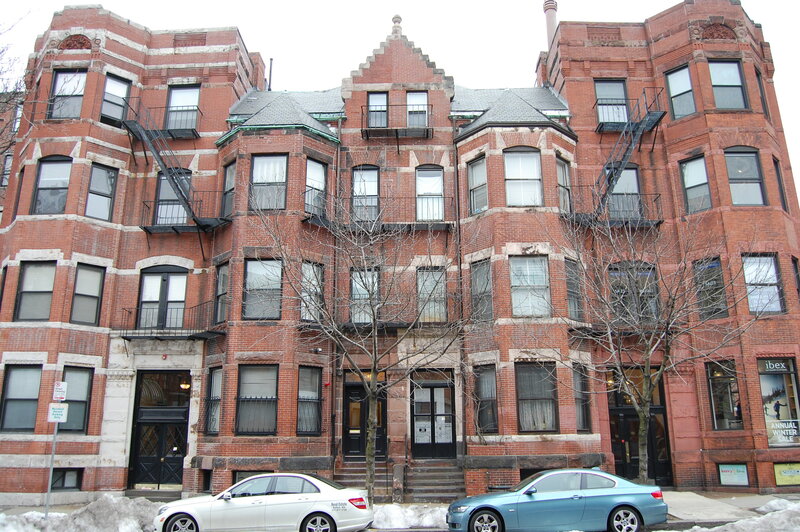 She lived at 18 Brimmer and owned several other properties in the Back Bay, most of which she operated as lodging houses. On June 21, 1965, 48 Hereford was purchased from Florence Pockwinse by attorney and real estate dealer Peter N. Kinder. He and his wife, Elizabeth, lived in an apartment at 192 Beacon. They operated 48 Hereford as a lodging house. On July 6, 1972, 48 Hereford was acquired from Peter Kinder by Robert A. Keating, an attorney. He and his brother, James Ronald Keating, had purchased 46 Hereford in January of 1970. Although they no longer owned the property, Peter Kinder and his wife continued to operate the lodging house at 48 Hereford. On September 2, 1978, 48 Hereford was purchased from Robert Keating by Dr. Amos E. Madanes, a physician, and his wife, and Anat E. Madanes. Amos and Anat Madanes lived in an apartment at 48 Hereford, and Peter and Elizabeth Kinder continued to operate a lodging house in the remainder of the building. On December 28, 1984, 48 Hereford was purchased from the Madaneses by Paul G. Roiff, trustee of the Solon Realty Trust. In March of 1985, he filed for (and subsequently received) permission to convert the property into two offices and five apartments. When the application was filed, the Building Department indicated that there was no record of the previous legal occupancy. In February of 1995, he filed for (and subsequently received) permission to convert the property into seven apartments. In September of 2005, Paul Roiff entered into a “Preservation Restriction Agreement” with the National Architectural Trust for the purpose of ensuring the preservation of 48 Hereford’s exterior. 48 Hereford remained an apartment house in 2017.